22/02/13 -- Soycomplex: It was a roller-coaster day for beans, which hit a 3 1/2 month high in overnight trade - with front month Mar 13 rallying well above the USD15/bu mark that have proven to be a difficult nut to crack - before slumping violently later in the afternoon. Weekly export sales of minus 119,500 MT old crop and only 62,000 MT of new crop were dismal against expectations of 500-900 TMT. The USDA did however throw the market a sop, reporting sales of 410 TMT of (admittedly mostly new crop) soybeans to China under the daily reporting system. Brazilian dockers at the port of Santos went on a 6-hour strike today, although there are reports that a second more nationwide stoppage planned for Tuesday has been called off. Other reports suggest that both parties have agreed a strike-free negotiation period that will last until mid-March. Nevertheless shipping delays in Brazil are said to be around 40 days at the moment, and look more likely to increase rather than decrease in the month ahead. 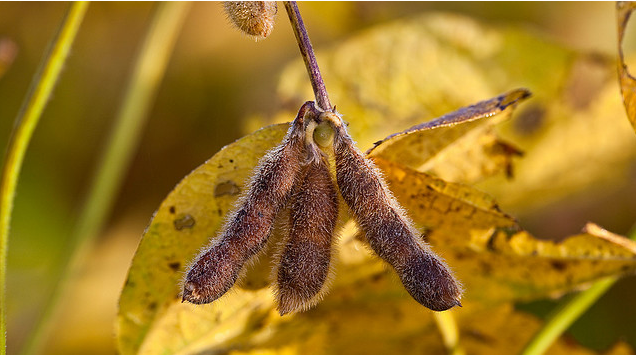 The second day of the USDA's February Outlook Forum said that 2013/14 US soybean ending stocks will double from 125 million bushels this year to 250 million next year - a seven-year high, according to Agrimoney.com. That does however assume that a) this season's ending stocks won't be tighter than the USDA currently project and b) that this season's crop does indeed turn out to be a record 3.405 billion bin-buster. Fund selling was estimated at 14,000 contracts on the day in beans. Mar 13 Soybeans closed at USD14.61 1/4, down 26 1/2 cents; May 13 Soybeans closed at USD14.43 3/4, down 26 3/4 cents; Mar 13 Soybean Meal closed at USD426.90, down USD10.40; Mar 13 Soybean Oil closed at 50.35, down 96 points. On the week front month beans were up 36 3/4 cents, meal up USD17.50 and oil down 127 points. Corn: The USDA weekly export sales for corn of 361,800 MT old crop and 20,100 MT of new crop beat expectations of 150-300 TMT. For once that actually came in ahead of the level required to hit USDA export targets for the season. Still, spillover weakness from falling soybeans in afternoon trade dragged corn modestly lower on the day. The USDA Outlook Forum said that 2013/14 corn ending stocks will triple to 2.177 billion bushels. That does include the caveat that US corn yields will rebound to a "trendline" 163.6 bu/acre - versus 123.4 bu/acre this year - and the second highest on record. It also however is based on a US planted area of "only" 96.5 million acres, many are forecasting plantings in the region of 97-99 million, and some are over 99 million. Thailand and Malaysia both tendering for 60,000 MT of optional origin corn for April shipment. South America may be the favourite to supply that. India continue to plug away with cheap feed wheat sales into Asia and beyond, picking up business that may otherwise have gone to corn. Yesterday's data from the Energy Dept shows that corn used for ethanol production in the US last week was 83.7 million bushels against the required 87.6 million bushels required to meet this crop year’s USDA estimate of 4.5 billion bushels of demand from that sector. Fund selling was estimated at a net 1-2,000 contracts on the day. Mar 13 Corn closed at USD6.90 1/4, down 1/2 cent; May 13 Corn closed at USD6.84 1/4, down 1 1/4 cents. On the week Mar 13 corn was 8 1/2 cents lower. Wheat: Wheat fell on the back of a perceived improvement in US winter wheat prospects following a major winter storm moving across the Plains and into the Midwest. "Very heavy snowfall has improved wheat potential in Kansas and Oklahoma, the number 1 and 2 top winter wheat states. Much of Kansas received 10-20 inches of snow, equating to 1-1.5 inch of snow melt. Oklahoma received 0.50 to 1.25 inch of moisture from mixed precipitation rain and snow. Precipitation was lighter in the Texas panhandle, the number 3 top hard red winter wheat state, with variable amounts from 0.10-0.65 inches. 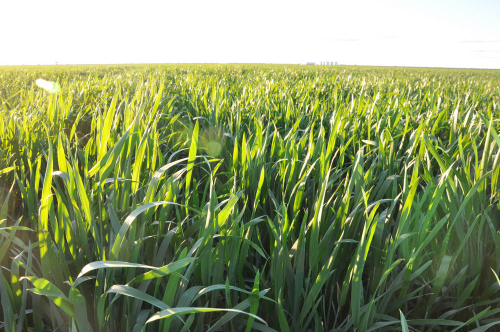 Wheat growing areas in northeast Colorado got 4-8 inches of snow, all very beneficial for hard red winter wheat. The storm lifted rapidly northward overnight spreading a wide band of heavy snow across Missouri, Nebraska, southern Iowa and central Illinois," said Martell Crop Projections. Weekly export sales of 699,300 MT of old crop and 56,600 MT of new crop were ahead of trade forecasts. The USDA Outlook Forum said that US wheat exports in 2013/14 will be 950 million bushels and that ending stocks will be 639 million. 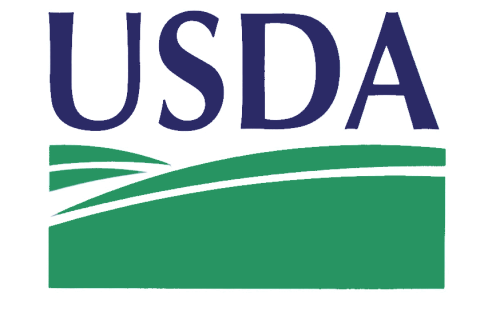 For 2012/13 the current USDA estimates are 1.08 billion and 691 million. Fund selling was estimated at 1-2,000 Chicago wheat contracts on the day. Mar 13 CBOT Wheat closed at USD7.15, down 6 1/4 cents; Mar 13 KCBT Wheat closed at USD7.49 3/4, down 7 1/2 cents; Mar 13 MGEX Wheat closed at USD8.02 3/4, down 3 3/4 cents. For the week Mar 13 Chicago wheat fell 27 1/4 cents, with Kansas down 27 3/4 cents and Minneapolis declining 20 3/4 cents. 22/02/13 -- EU wheat futures closed mixed, seemingly treading water until a clearer picture develops regarding new crop prospects once wheat emerges from winter dormancy. Old crop prices remain buoyed by the continued rapid pace of EU export sales which are now 46% ahead of this time a year ago, although the huge increase in UK imports has tempered domestic demand here. The exceptionally poor quality of this season's crop seems to have encouraged consumers to get their cover on earlier and in greater percentages than normal to ensure supplies. FranceAgriMer said that winter wheat crop conditions there are 66% good/excellent versus 74% this time last year. The have 12% of the crop rated poor/very poor against 6% this time twelve months ago. They say that only 84% of the crop has reached the tillering stage versus 99% this time last year. On the day London wheat closed with front month Mar 13 down GBP0.60/tonne at GBP203.55/tonne and new crop Nov 13 GBP1.35/tonne lower at GBP186.15/tonne. Mar 13 Paris wheat was EUR0.50/tonne higher at EUR243.00/tonne. For the week as a whole that puts Mar 13 London wheat down GBP0.70/tonne, Nov 13 up GBP0.65/tonne and Mar 13 Paris wheat down EUR1.25/tonne. US wheat has been under pressure this past few days after what is being called "the largest snow storm in years" hit the western plains before moving onto the Midwest, potentially relieving moisture stress for winter wheat planted in parched conditions and still in dormancy. Weekly export sales for US wheat, delayed until today because of Monday's President's Day Holiday, were better than trade expectations of 350-600 TMT at 699,300 MT old crop and 56,600 MT new crop. China was a confirmed buyer of both old and new crop, although not in the volumes that have been rumoured of late. There was no confirmation of any sales to the UK or Russia however. The IGC pegged world wheat production in 2012/13 unchanged from last month at 656 MMT, with ending stocks raised 2 MMT to 176 MMT. "World output for 2013/14 is tentatively projected up 4% year-on-year, but much is expected to be absorbed by higher demand and stocks are forecast to rise by only 2 MMT," they added. Following this week's Egyptian government tender, where they only bought just the one cargo (as they also did in their last tender) there have also been rumours in the market that private Egyptian buyers may also have been enquiring for wheat. The FT ran a story this week saying that the political instability there and weak Egyptian pound are behind Egypt's general absence from the market and that subsequently domestic wheat stocks are only half of what they would normally be. The Egyptian government reportedly spend USD5.5 billion a year on food subsidies, much of which is used to buy wheat. Meanwhile GASC's high profile vice chairman and the man regarded as generally being responsible for the government's wheat purchasing program, Nomani Nomani, stepped down from his job this week. 21/02/13 -- Soycomplex: At day one of the USDA Outlook Forum US 2013 spring soybean plantings were estimated at 77.5 million acres versus the USDA baseline projection of 76.0 million and 77.2 million in 2012. Production in 2013 was estimated at a record 3.405 billion bushels, up 390 million from 2012. The USDA also estimated the average soybean price in 2013/14 at USD10.50/bushel. Stocks estimates will be released tomorrow. Separately the USDA announced 130,450 MT of US soybeans sold to unknown – 75,540 MT of old crop and 55,000 MT of new crop. There's a Brazilian port strike set for tomorrow and another lined up for next week, which will only serve to further increase port congestion there. Vessel line-ups waiting to load beans are already said to be double versus this time a year ago. Lanworth Inc yesterday cut their 2012/13 Argentina soybean harvest outlook to 49.6 MMT versus 51.6 MMT previously. The USDA has production pegged at 53 MMT. The same company also pegged Brazilian soybean production at 81 MMT versus 80.3 MMT previously. The Buenos Aires Cereals Exchange pegged Argentine production at 50 MMT. Trade estimates for tomorrow's weekly export sales report for beans are 500-900,000 MT. The IGC estimated the global 2012/13 soybean crop at 269.0 MMT versus a previous estimate of 271.0 MMT. Fund buying in beans was estimated at around 3,000 contracts on the day. Mar 13 Soybeans closed at USD14.87 3/4, up 5 cents; May 13 Soybeans closed at USD14.70 1/2, up 2 cents; Mar 13 Soybean Meal closed at USD437.30, up USD3.70; Mar 13 Soybean Oil closed at 51.31, down 76 points. Corn: The Outlook Forum pegged US corn plantings at 96.5 million acres versus the USDA baseline projection of 96.0 million and 97.2 million in 2012. Production was forecast at 14.53 billion bushels versus a USDA baseline projection of 14.435 billion and the 2012 crop of 10.780 billion. The 2013/14 average corn price was estimated at USD4.80/bushel. Corn use for ethanol production was increased to 4,675 million bushels from 4,500 million in 2012/13. The Energy Dept reported the weekly ethanol grind rose 8,000 barrels/day to 797,000 bpd. Taiwan bought 60 TMT of Argentine corn for April shipment. Oman bought 20 TMT of Argentine corn for April shipment. The Buenos Aires Cereals Exchange estimated the Argentine corn crop at 25.0 MMT versus the USDA's 27 MMT. The IGC estimated the global 2012/13 corn crop at 850 MMT versus their previous estimate of 845 MMT. The IGC estimated this year's Indian corn crop at 20.6 MMT versus a previous estimate of 18.0 MMT. Estimates for tomorrow's weekly export sales report are 150-300 TMT. There are said to be 59 ships are waiting to load grain at the Brazilian port of Santos versus 29 ships this time a year ago, and 82 ships waiting to load at Parangua versus 31 ships a year ago. Port workers at Santos begin a wildcat strike tomorrow. Fund selling in corn was estimated at a net 8,000 contracts on the day. Mar 13 Corn closed at USD6.90 3/4, down 9 3/4 cents; May 13 Corn closed at USD6.85 1/2, down 10 3/4 cents. Wheat: News of a major winter storm sweeping across the Plains and Midwest was enough to get wheat on the defensive, with Southern Nebraska expected to receive 12-18 inches of snow today, according to Martell Crop Projections. The Outlook Forum placed US 13/14 US all wheat production at 2.1 billion bushels versus a USDA baseline projection of 2.19 billion and the 2012 crop of 2.269 billion. The 2013 US wheat acreage was estimated at 56 million acres versus a USDA baseline projection of 57.5 million and 55.7 million in 2012. The 2013/14 average wheat price was estimated at USD7.00/bushel. Separately the USDA announced the sale of 110 TMT of US soft red winter wheat sold to unknown – 55 TMT old crop and 55 TMT new crop. Argentina’s Ag Ministry estimated their 2012/13 wheat crop at 9.4 MMT versus a previous estimate of 10.1 MMT. The USDA still have the crop at 11.0 MMT. Output in 2011/12 was 15.5 MMT, so if the Ministry are correct then production is down almost 40% this season. Iran bought 180 TMT of Australian wheat for April shipment. Iraq was said to have bought 300 TMT of the same origin. Tomorrow's weekly export sales will be important for a wheat market that is looking tired. Trade estimates are for sales of 350-600,000 MT versus last week's total of 706,300 MT. Given all the recently rumoured business to Russia, China and Europe it will be interesting to see if any of that turns up in this week's report. Funds were judged to have been net sellers of around 6,000 Chicago wheat contracts on the day, adding to their already significant short-holding. Mar 13 CBOT Wheat closed at USD7.21 1/4, down 17 1/4 cents; Mar 13 KCBT Wheat closed at USD7.57 1/4, down 20 cents; Mar 13 MGEX Wheat closed at USD8.06 1/2, down 14 1/4 cents. 21/02/13 -- EU wheat futures closed mostly lower as once again early strength subsided in afternoon trade, turning screens red once US wheat futures took a turn for the worse on news for a large dose of precipitation for the Plains and Midwest. Strong demand for EU wheat continues however, with Brussels issuing another large 588,763 MT of soft wheat export licenses for the week through to Feb 19, bringing the 2012/13 marketing year-to-date total to 12.69 MMT for a hefty year-on-year increase of 46 percent. Despite that news, Mar 12 London wheat finished down GBP1.60/tonne to GBP204.15/tonne, benchmark May 13 was GBP1.05/tonne lower at GBP206.70/tonne and new crop Nov 13 was GBP0.65/tonne easier to GBP187.50/tonne. Mar 13 Paris wheat fell EUR1.25/tonne to EUR242.50/tonne. Further evidence of the strong demand for EU wheat was reflected in news from the Germany Statistical Office that Jul/Dec 2012 grain exports were up 44% to 5.9 MMT. Of that total wheat exports accounted for 3.4 MMT, an increase of 61% on the same period in 2011. Barley exports were up 50% to 813 TMT. Whilst we will have to wait until tomorrow to see if the USDA put any more flesh on the bones of the recently reported US wheat sales to China, Russia and the UK they did today confirm the sale of 110 TMT of SRW wheat to "unknown" - split 50:50 between old and new crop. That isn't the only international business going on either. Egypt bought 60,000 MT of US wheat yesterday, Ethiopia has a 35,000 MT tender pending, Bangladesh is in for 50,000 MT and Syria’s tender deadline is March 4th. In addition to that Tunisia bought 67,000 MT of optional origin durum wheat yesterday and Jordan purchased 50,000 MT of optional origin wheat overnight. This morning we had news of Iraq booking 300,000 MT of Australian wheat along with a further 180,000 MT from the same seller going to Iran. Black Sea sellers remain largely out of the market. Kazakhstan said that it's Feb 1 grain stocks were down 34.6% to 12.4 MMT. Any surplus it does have to sell is likely to go to Russia. Whilst the old crop supply & demand equation continues to look tight, things are starting to develop a more bearish look going forward. Day one of the USDA's Outlook Forum, which provides their first glimpse into plantings and production for the coming season, pegged US all wheat plantings at 56 million acres - around a quarter of a million up on the area sown for the 2012 harvest. Despite that, production is seen down around 7.5% this year to 2.1 billion bushels (57.15 MMT) versus 2.27 billion (61.76 MMT) in 2012. Corn plantings of 96.5 million acres will however produce a record crop of 14.53 billion bushels, up nearly 35% on last year's drought-hit production. Meanwhile, a soybean area of 77.5 million acres will also provide output of a record 3.405 billion bushels, up 13% on 2012. This all depends on a return to "normal" yields this year of course, and with no serious weather problems. US wheat prices were forecast to average USD7.00/bushel in 2013/14, with corn falling to USD4.80/bushel and soybeans down to USD10.50/bushel. US winter wheat prospects are looking a fair bit brighter than they were a month or so ago. "A powerful storm today is causing heavy snowfall in top wheat states in the Great Plains. This storm would lift into the Midwest bringing welcome precipitation to drought affected corn farms in Iowa and Minnesota. The overnight radar showed very heavy snowfall in central Kansas and northern Oklahoma. The forecast is for heavy snow that, when melted, would be around one inch of moisture, greatly benefiting dry wheat farms," say Martell Crop Projections. "Kansas wheat farms have accrued a 2 inch soil moisture deficit since October 1 with reduced rainfall. Oklahoma, the driest of the bread-wheat states, has a 3.5 inch moisture deficit. Heavy storm precipitation is very welcome in the US top 2 winter wheat states," they add. The USDA attaché in Dehli estimates the upcoming Indian wheat crop at 92.0 MMT, slightly lower than the local Ag Ministry's 92.3 MMT forecast and down 3% on last year's record 94.9 MMT. Despite a recent active export program they are still expected to have large carryover stocks at the end of the season, this will enable them to sell around 8 MMT (from 6.5 MMT in 2012/13) of wheat to foreign buyers in 2013/14 the attaché said. 21/02/13 -- Day one of the USDA's Annual February Outlook Forum has kicked off with a range of early forecasts for US grains production in the year ahead from their Chief Economist Joseph Glauber. US farmers are likely to plant 96.5 million acres of corn and 77.5 million acres of soybeans this spring, along with 56 million acres of all wheat - more than half of the latter which will already be in the ground. Predictably forecasting a return to "normal" yields this year that potentially gives us a record corn crop of 14.53 billion bushels, up nearly 35% on last year's drought-battered production. Soybean output may also reach a record 3.405 billion bushels, up 13% on 2012. Wheat production is forecast to come in at 2.1 billion bushels, down 7.5% on last year despite a small increase in planted area, presumably reflecting the poor state of the winter crop as it went into dormancy. Whilst at first glance you might call these numbers bearish for corn and soybeans, both the USDA acreage numbers are actually lower than many of the trade estimates that were already in the market. The corn figure is actually lower than last year and the soybean estimate only marginally higher. For what it's worth this time a year ago the Forum pegged corn acres at 94 million, soybeans at 75 million and all wheat at 58 million. What we got in the end was 96.9 million, 77.2 million and 55.74 million respectively. So there clearly could be a couple of million acres either way between today's estimates and the final reality. 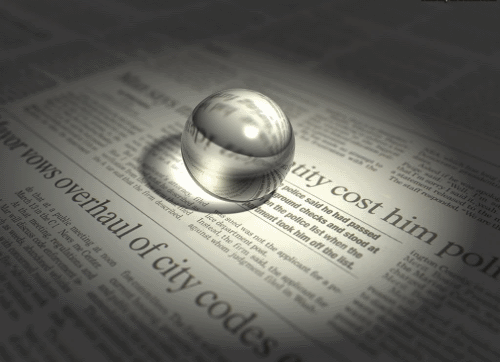 Stocks forecasts are not expected to be released until tomorrow. 21/02/13 -- The USDA attaché in Dehli estimates the upcoming Indian wheat crop at 92.0 MMT, slightly lower than the local Ag Ministry's 92.3 MMT forecast and down 3% on last year's record 94.9 MMT. Even so, that's well above domestic consumption levels. Given 2012/13 ending stocks projected at 23.8 MMT (well above the government's recommended minimum buffer of 7.0 MMT) then it looks like India will continue to be a force to be reckoned with on the international export stage for at least another year yet. The attaché forecasts 2013/14 wheat exports at 8.0 MMT, of which 5.0 MMT will be come from government stocks and 3.0 MMT will private sales. 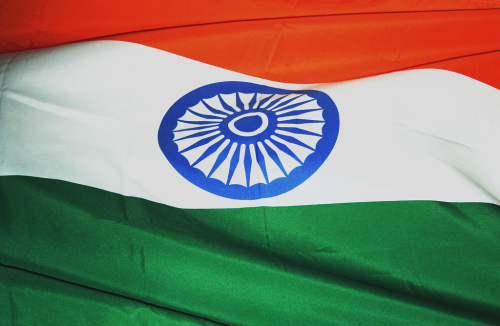 The USDA currently have India down to export 6.5 MMT of wheat in the current 2012/13 season. 21/02/13 -- Rapemeal prices on the continent are mostly firmer again, following last night's gains in Chicago soymeal. The nearby market remains particularly tight with no offers for Feb collection and Mar up EUR7.00/tonne in the past week. 20/02/13 -- Soycomplex: Beans got within 8 cents of USD15/bu, a level that has proven to be a tough nut to crack for some time, but failed. Nevertheless, prices have still posted decent gains since the return from the long weekend. Strong rumours abound of China booking US beans, and although we got confirmation of two cargoes from the USDA yesterday there were no such announcements today. A Brazilian port workers strike is earmarked for Friday and another for Tuesday, further increasing shipping delays. Reports suggest around double the number of vessels waiting at ports in Brazil to load soybeans compared with this time a year ago. This may continue to push Chinese demand to the US, and stocks there are already pencilled in to be alarmingly tight at the end of the season. There are unconfirmed reports that China has bought up to 10 cargoes of US beans for Feb/March shipment since they returned from holiday. A Beijing consultancy company said soybean inventories at Chinese ports will be below 4.0 MMT by the end of March. A year ago stocks were said to be 6.0 MMT. Japan imported 249,370 MT of soybeans in January, up 19.2% from a year ago. Funds were said to have bought around a net 5,000 soybean contracts on the day. At the close Mar 13 Soybeans were USD14.82 3/4, up 12 1/2 cents; May 13 Soybeans closed at USD14.68 1/2, up 11 1/4 cents; Mar 13 Soybean Meal closed at USD433.60, up USD8.30; Mar 13 Soybean Oil closed at 52.07, down 46 points. Corn: The corn market put in quite a resilient performance, helped by spillover strength from beans, considering that crude oil crashed a couple of dollars. Cattle futures were also sharply lower. The demise of the latter two may have been linked to rumours circulating that a large un-named hedge fund is in trouble and being forced to liquidate some of their positions. The weekly ethanol production data, normally released on a Wednesday, isn't out until tomorrow due to the President's Day holiday on Monday. Amidst talk of improved margins of late the bulls will be hoping for an improvement on last week's daily grind of 789,000 barrels. A slump in crude oil prices might not help a fledgling recovery into next week though. Japan's Ministry of Agriculture said that the nation's December usage of corn in animal feed was 42.7% versus 45.2% a year ago. Wheat usage was up. Japan imported 14.9 MMT of corn in 2012, down 2.5% from a year previously. The US share of that market is also shrinking – down to 74.7% from 90.1% in 2011. Funds were said to have been net buyers of around 3-5,000 contracts on the day. Mar 13 Corn managed to score a little bonus by closing above USD7.00/bu, albeit very narrowly at USD7.00 1/2, up 5 1/4 cents on the day; May 13 Corn closed at USD6.96 1/4, up 4 1/4 cents. Wheat: The US weather outlook for winter wheat has improved, with significant snow and rain expected in most areas this week. How much good that will do for a crop that went into dormancy in the worst state on record, and has deteriorated significantly since, remains to be seen in the spring. "Wheat is a weed," as they say, so it's resilience looks like being tested once again. News that Egypt bought US wheat was tempered by the fact that they only booked one cargo and said that they have ample supplies to last them into the early summer. Jordan bought 50 TMT of optional origin wheat for March shipment. Of more note was a Reuters report suggesting that China may have bought as much as 1 MMT of wheat in recent days, split between US, Canadian and Australian origin. Stocks there are clearly tight, at least they are of quality wheat, as almost all this business was said to have been done for April shipment. The Chinese government said that they will begin to auction wheat from state-owned reserves starting Feb 27. Russia’s Grain Union estimated the 2013 Russian grain crop at 90.0 MMT. The Ag Ministry currently say 95.0 MMT. Fund buying was estimated at 2,000 lots in Chicago today. Mar 13 CBOT Wheat closed at USD7.38 1/2, up 6 1/4 cents; Mar 13 KCBT Wheat closed at USD7.77 1/4, up 8 1/4 cents; Mar 13 MGEX Wheat closed at USD8.20 3/4, up 5 cents. 20/02/13 -– EU grains closed mostly firmer, although another sluggish performance by Chicago wheat and corn kept a lid on potential price rises. America finally do seem to be picking up some volume wheat business, which will make this week's weekly export sales report of interest. European sales meanwhile have displayed no sign of letting up at all this far, so perhaps understandably there was no EU wheat offered in the latest Egyptian tender. The EU markets closed the day with Mar 13 London wheat up GBP0.75/tonne to GBP205.75/tonne, benchmark May 13 also GBP0.75/tonne firmer to GBP207.75/tonne and new crop Nov 13 GBP1.15/tonne higher at GBP188.15/tonne. Mar 13 Paris wheat declined EUR1.25/tonne to EUR243.75/tonne. The pound fell off a cliff following the release minutes of the BOE's MPC meeting this month which showed a 6-3 vote against more quantitative easing this month, with Bank governor Sir Mervyn King being among those in favour of more action. That added support to London wheat as sterling slumped to it's lowest level since Oct 2011 against the euro and since Jun 2012 versus the dollar, making imports more expensive. Talking of imports, customs data released today shows that the UK shipped in more wheat in December (up 225% on Dec 2011 at 305,584 MT) than in any previous month on records dating back to July 1992, according to the HGCA. Halfway through the 2012/13 marketing year that places total wheat imports at 1.34 MMT, almost three times the volume imported during the same period the previous season. UK December wheat exports meanwhile were down 89% year-on-year to just 35,130 MT. Egypt bought only one cargo of US wheat in it's latest tender. Booking 60 TMT of US SRW wheat at USD296.75/tonne FOB the Mississippi River, plus USD28.85/tonne freight, for Apr 10-20 shipment. There were no other origins offered. The Egyptian Ministry said that they have enough wheat in reserve to last them until late June. There are some questioning how long they can continue to stump up the USD5.5 billion that the country spends on state food subsidies every year, given the ongoing political turmoil and currency devaluation in Egypt. The lowest offer in a Bangladeshi tender to import 50 TMT of wheat in Mar/Apr was apparently USD328.16 including freight. China is now very strongly rumoured to have bought 400 TMT of Australian wheat, along with 100 TMT from Canada on top of the suggested 350 TMT that they've already purchased from the US in recent days, according to a report on Reuters. The bulk, if not all, of this wheat is said to be for Apr/first half May shipment. 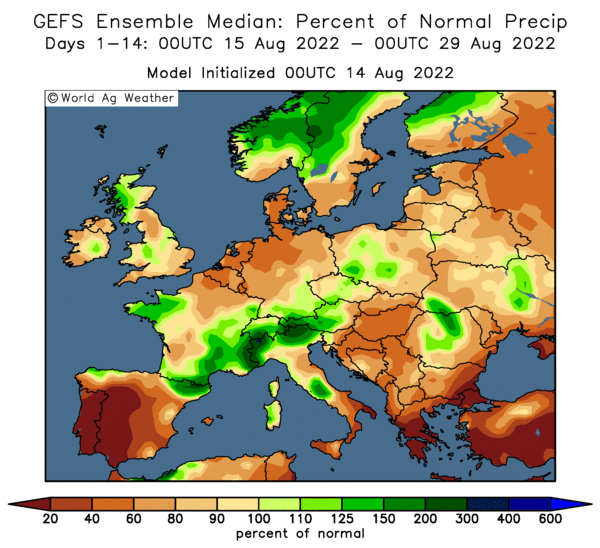 The quality of last season's crop was generally poor, and it looks like they need to buy in some better grade wheat ahead of new crop harvesting which takes place May/Jun. Russia sold a further 62,439 MT of it's intervention grain stocks, bringing the total volume of sales so far to 1.94 MMT. The Russian Grain Union said that the country may harvest 90 MMT of grains this year and export 20 MMT in the 2013/14 marketing year that begins in July. Exports in the current season are currently around 13.7 MMT and expected to be in the region of 14.5 MMT at the end of June. US winter wheat on the Great Plains is in with another shot of some much needed moisture relief this week. This current radar shows light snowfall in areas of southwest KS whilst rainfall is covering nearly all of the state of OK. This isn't quite a drought-buster just yet though. The NOAA precipitation outlooks have "normal" precipitation expected for most of the western plains with the exception of "below normal" for western KS and OK. The 8-14 day map shows "below normal" precipitation for the entire western plains. 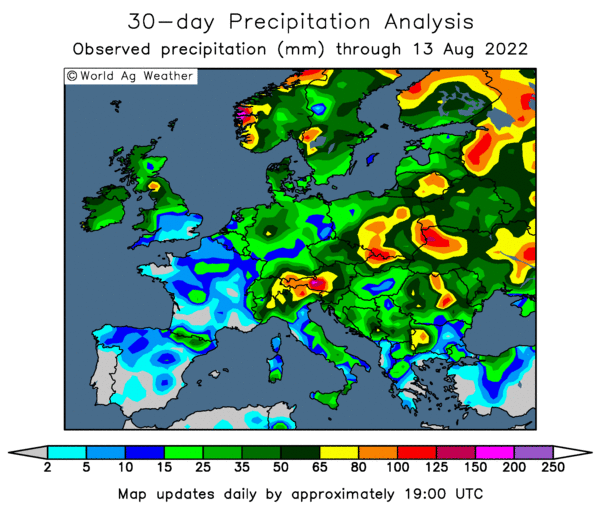 RMI Analytics say that malting barley production in Europe this year could fall 13% to 8.8 MMT as farmers plant less of the grain due the the historically low premium over feed barley, says a report on Bloomberg today. Malting barley was one of the worst performers in the grains sector in 2012, with prices falling almost 5% year-on-year, whereas London feed wheat prices rose by almost 35% and Paris milling wheat futures by nearly 24% during the same period. 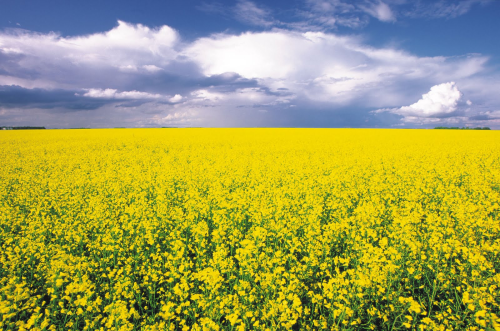 20/02/13 -- Rapemeal prices on the continent remain fully steady. Steep gains last night in Chicago soymeal values are supportive. Nearby availability remains tight although consumers seem adequately covered until May. 20/02/13 -- A glance at the overnight markets shows follow through buying in soybeans/meal, and even a bit of modest spillover support for corn and wheat. It seems to have taken the trade a very long time to wake up to the fact that a record large Brazilian soybean crop (coupled with a near record corn crop) means record large logistical problems. The currently touted 30-40 day shipping delays may only be the tip of the iceberg. The problem could be compounded by Argy farmers reluctance to part with their beans, an excellent interpretation of the reasons why being here. Combine that with the US shipping soybeans at four times the rate needed to hit the USDA's target for the season and there's some serious trouble ahead methinks. The world hasn't and isn't running out of soybeans. It's just getting hold of them that's the problem. A bit like trying to buy a pie and a pint at half time at Goodison Park. You know that they've got plenty of pies and pints, it's just that there's only one little window, with three of them on, including the new girl who's frankly about as much use as Anne Frank's drumkit. Well, that's what it's going to be like trying to get hold of soybeans (and meal) across the next few months IMHO. And we haven't even started talking about the inevitable strikes yet. Don't panic, the cavalry are coming. Eventually. They just need to saddle up the horses. Well they need to find the horses first, as they seem to have all gone AWOL lately. The USDA's February Annual Outlook Forum takes place at the end of the week. They will put out some early suggestions of what US farmers might plant this spring. A few private estimates are already out there. Corn plantings are in the 97.5-99.5 million acre ballpark, versus 96.9 million in 2012. The soybean planted area sees guesses around 78-79 million, versus 77.2 million last year. A return to anything like trendline yields would obviously see production of both soar. Not that a return to trendline yields is a given of course. In other news this morning I read on Twitter, but cannot confirm as yet, that China has bought 350 TMT of US wheat in the past 10 days. If true that would be consistent with the recently rumoured business. Last week the USDA confirmed only one cargo of wheat sold to China in the regular weekly export sales report. Also popping up on Twitter in the last few minutes are reports that my old jacuzzi wrinkled chum Nomani Nomani, vice chairman of Egypt's state wheat buyer GASC, has left his post. Where and why he left it is unsaid. I'd try asking in reception if they've seen it. It's in a brown jiffy bag with paw prints on it. A whiffy jiffy you might say. Also popping up on Twitter this morning is news that UK December wheat exports were down 89% to just 35,130 MT. Not too many surprises there. That brings Jul/Dec wheat exports to 512,129 MT, down 68% on 2011/12. Dec wheat imports meanwhile were up 225% to 305,584 MT, which the HGCA say is the highest monthly total in records dating back to July 1992. BoE minutes from the MPC monetary policy meeting held at the beginning of the month show were released at 9.30am this morning. The minutes highlighted indecision within the ranks of the committee, showing policymakers were split six to three on whether to increase the bank's quantitative easing program. The pound immediately slumped to it's lowest level since Oct 2011 against the euro and since Jun 2012 versus the dollar. The demised of sterling is supporting London wheat this morning, with May 13 currently GBP3.50/tonne higher at GBP210.50/tonne. 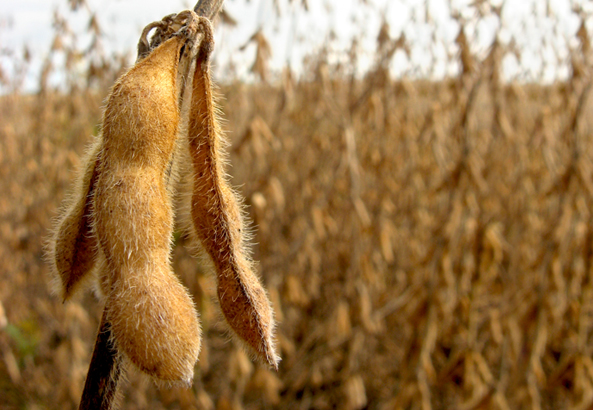 19/02/13 -- Soycomplex: China and the US were open for business at the same time in more than a week, and the USDA promptly confirmed 120 TMT of old crop soybeans sold to the world's largest buyer. It's interesting that they are still buying old crop after last week's cancellations prompted some to announce that demand had finally switched to South America. Some reports suggest that up to 11 MMT of beans, meal and corn are waiting to load at Brazilian ports currently, where shipping delays are said to be 30-40 days. The only thing that's surprising about that is that these delays are "only" 30-40 days. Things could get much worse before they get better, especially with Argentine farmers holding onto beans as a hedge against inflation and the rapidly devaluing peso. Weekly export inspections were 40.38 million bushels, up nearly 10 million from last week and more than four times the level required to hit USDA targets. Early soybean yields in Mato Grosso, where Celeres peg the harvest at 29% done versus 35% a year ago, are said to be a bit lower than hoped for. Celeres said that nationally the soybean harvest is 19% complete and that 59% of the crop is sold versus 55% this time a year ago. Mar 13 Soybeans closed at USD14.70 1/4, up 45 3/4 cents; May 13 Soybeans closed at USD14.57 1/4, up 42 1/2 cents; Mar 13 Soybean Meal closed at USD425.30, up USD15.90; Mar 13 Soybean Oil closed at 52.53, up 91 points. Fund buying was estimated at around 10-12,000 soybean contracts on the day. Corn: Despite a strong performance from the soycomplex, corn couldn't build on that. Weekly export inspections of 9.5 million bushels were down 5 million on last week and well below the more than 20 million needed to hit USDA targets. Inspections are more than 56% behind last year's pace. Safras e Mercados said as of Feb 15th 17% of the Brazilian summer corn crop has been harvested versus 14% a year ago. They also said that 34% of Brazil’s 2nd corn crop has been planted versus 29% a year ago. Michael Cordonnier upped his forecast for Argentine corn production this year from 22.5 MMT to 24 MMT, leaving his Brazilian estimate unchanged at 70 MMT. The USDA Outlook Forum on Thursday and Friday this week will provide a first glimpse from them into prospective US spring plantings and ending stocks for 2013/14. Both are expected to be large. In January Informa Economics pegged US corn plantings at at 99.3 million acres, up 2.4 million acres on the 2012 planted area, and that was the largest acreage in 75 years. India are said to be actively selling new crop wheat into Asian homes that may otherwise have bought corn. Mar 13 Corn closed at USD6.95 1/4, down 3 1/2 cents; May 13 Corn closed at USD6.92, down 5 cents. Funds were estimated to have been net sellers of around 6,000 corn contracts on the day. Wheat: As with corn, wheat couldn't manage to garner enough support from soaring soybeans to climb into positive territory. This was despite export inspections of 30.33 million bushels. That was up 10 million from last week and well above trade expectations of 15-20 million. It's widely reported, and partially confirmed, that US wheat has been sold into China and Brazil. It's rumoured that more business has been done into China than has been formally announced so far. There's been no confirmation as yet of the suggested sales to Europe or Russia. Australian wheat was said to have undercut US wheat by around USD5-10 in the Iraqi tender that closed at the weekend. Japan are tendering for almost 100 TMT of milling wheat for March-May shipment of a mixture of US, Australian and Canadian origin. They are said to be 85% covered through to April. Egypt are also back in the market, although only nibbling, tendering for 55 TMT of soft and/or milling wheat for April 10-20 shipment. They are said to be well covered through until the summer and only bought one US cargo in their last tender a couple of weeks ago. A major storm system moving across the Great Plains is seen bringing beneficial moisture to US winter wheat areas. Mar 13 CBOT Wheat closed at USD7.32 1/4, down 10 cents; Mar 13 KCBT Wheat closed at USD7.69, down 8 1/2 cents; Mar 13 MGEX Wheat closed at USD8.15 3/4, down 7 3/4 cents. Fund selling in Chicago wheat was estimated at 3,000 contracts on the day. 19/02/13 -- EU wheat futures closed lower. Soybeans and meal led the overnight grains higher after a 3-day weekend in the US, with wheat and corn initially following on. 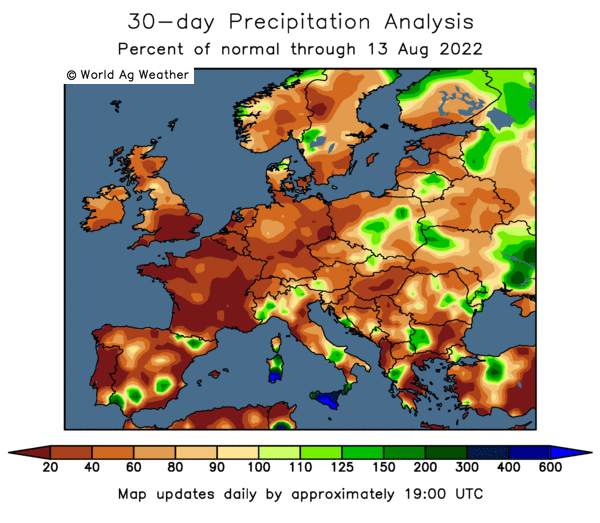 Supporting soybeans were weekend rains in Argentina being a bit of a let down, proving to be mostly confined to the northern half of the country. However, US wheat and corn markets turned lower in afternoon trade, dragging European grains down with them. The EU markets closed the day with Mar 13 London wheat down GBP0.50/tonne to GBP205.00/tonne, benchmark May 13 also falling GBP0.50/tonne to GBP207.00/tonne and new crop Nov 13 GBP0.40/tonne weaker at GBP187.00/tonne. Mar 13 Paris wheat declined EUR0.75/tonne to EUR245.00/tonne. Russia sold a just short of 65 TMT of it's intervention grain stocks in what has become a regular twice weekly offering, taking the total sold since sales began on Oct 23 to 1.88 MMT. The Russian Statistics Agency said that grain stocks on Feb 1 were 22.6 MMT - a fall of almost 30% on a year ago. There's continued talk that they will import wheat from the US, and maybe Europe too, but there has been no official confirmation as yet. An unusually early start to spring planting in Ukraine is said to be on the cards, due to much warmer than normal temperatures. The lack of snow cover may prove to be a problem if winter there proves to have a sting in it's tail however. The trade awaits the results of the Iraqi wheat tender which closed at the weekend. Australian offers were said to be the cheapest. Their last tender was won by Australian and Canadian wheat. Morocco said it had imported over 14% more grain in 2012/13 (to the end of Jan) than in the previous season. Total imports stand at 3.43 MMT, including 1.37 MMT of wheat and 1.53 MMT of corn. The main supplier of the wheat was Ukraine (640 TMT), France (490 TMT) and Canada (440 TMT). Almost all the corn came from Brazil (1 MMT) and Argentina (500 TMT). They also announced that they'd bought 176 TMT of soft wheat on the local market in a tender over the weekend. Indian ministers are said to be seeking government approval to increase the volume of wheat permitted for export in 2012/13from 4.5 MMT to 5.0 MMT. Whilst the Ministry are standing by a small drop in production from last year's record 94.9 MMT to 92.3 MMT this year, some private analysts are forecasting wheat production to match, or even better, last year. India is already said to have made new crop sales of 500-750 TMT into Asian homes in South Korea, Taiwan, Thailand, Malaysia, Indonesia, and Vietnam for shipment April/June. In the US: "A strong storm is predicted tomorrow in the Great Plains causing heavy precipitation in hard red winter wheat. A mixture of rain, sleet and snow is expected in Kansas and Oklahoma, bringing at least 0.75 inch but up to 1.25 inches of moisture," say Martell Crop Projections. "Southern Great Plains precipitation has increased in January and February with a higher frequency of winter storms, all 3 major wheat states now currently reporting near-normal winter moisture. Drought worries are not over, however, due to very dry subsoil from historic drought last summer and fall. Oklahoma, the US second largest wheat state, has benefited from increased winter precipitation. Around 2 inches of rainfall has occurred, against 2.6 inches, normally, December to the present. Going back to mid July, however, the Oklahoma wheat moisture deficit is 5 inches," they add. Fund money continues to sell corn and wheat on the Chicago market. Last Friday's Commitment of Traders report shows trend-following funds (non-commercials net of index funds) held a net long position of 39,103 contracts in CBOT corn as of last Tuesday night, down a staggering 59,316 contracts on a week previously. The same trend-following funds held a net short position of 67,578 contracts in CBOT wheat, up 5,925 for the week. 19/02/13 -- Dairy farmers are faced with an unenviable dilemma. Cows need a supply of high quality bypass protein to sustain high yields but the cost of soya, the more common source of bypass protein in dairy diets is near record levels with prices looking set to remain high. NWF Technical manager Tom Hough says there is an effective, proven solution. Why do cows need bypass protein? Rumen bypass protein, usually referred to as MPB or DUP, is an essential component of the diet of high yielding dairy cows. In simple terms, a cow meets her demand for protein from a combination of microbial protein produced in the rumen and from protein sources fed in the diet which pass through the rumen undigested, effectively bypassing the rumen. Protein demand increases as milk yield rises. While the supply of microbial protein produced increases gradually as yield rises, the proportion of protein required from bypass sources rises more quickly. The higher the yield, the greater the demand for bypass protein. No matter how efficient the rumen is, high yielding cows need an additional source of protein to meet their requirements. If diets do not contain sufficient bypass protein then cows will not milk to their potential and margins will suffer. The problem is that prices for feeds traditionally used as a source of bypass protein, specifically soya, are at record levels meaning that supplying the necessary protein from usual sources is an expensive business. The good news is that there is a solution to this problem which not only helps meet the cows’ demands for bypass protein but is more sustainable, cost effective and can be a proven replacement in the diet, something our European neighbours have successfully adopted. All protein sources used in dairy diets contain a mix of rumen degradable and rumen bypass protein. The proportion of bypass protein in any feed depends on a range of factors but we now know how to treat protein sources to increase the proportion of bypass protein they contain. In doing so we can boost the value of protein sources at a reduced cost which means you can give your cows the quality nutrients they require at the best available price. NWF Ultra Pro-R has been developed by our in-house technical team and manufactured at our UFAS registered mill. Our experts have developed a feed manufactured from rapeseed meal which has been treated to reduce the degradability of the protein in the rumen. The quality of the protein is improved without reducing the quality of amino acids supplied. The result is a product that is an extremely cost-effective source of the quality protein your cows need. NWF Ultra Pro-R has a higher bypass protein content than soya but with a lower price, providing optimum performance and value in the balanced diet. The table compares NWF Ultra Pro-R with untreated rapeseed and soya. It shows the effect of our unique treatment process on the proportion of bypass protein. Based on current prices, NWF Ultra Pro-R is less than half the price of untreated soya on a cost per unit MPB basis and is the most cost effective source of MPB available in the UK today. With a winter diet formulated to provide a base diet of M+25 litres to a 250 cow herd, reducing soya in the blend and instead using a mix of soya and NWF Ultra Pro-R could save 10p per cow/day, giving a saving of over £5,000 over the winter months, while ensuring that cows have the quality protein they need to milk to their potential. To find out more about NWF Ultra Pro-R, talk to your NWF sales specialist or call 0800 756 2787. 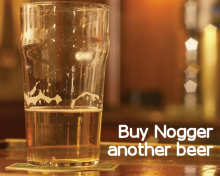 And don't forget to mention Nogger's Blog when ordering! 19/02/13 -- Rapemeal prices on the continent are firmer again, following overnight gains in Chicago soymeal. The dogs are barking that all is not well with the French rapeseed crop, ditto ours in the UK. 18/02/13 -- EU wheat futures closed higher at the end of a quiet session, with little fresh news to occupy traders' minds with US markets closed for the President's Day holiday. Mar 12 London wheat finished up GBP1.25/tonne to GBP205.50/tonne, benchmark May 13 was GBP0.75/tonne higher at GBP207.50/tonne and new crop Nov 13 was GBP1.90/tonne firmer to GBP187.40/tonne. 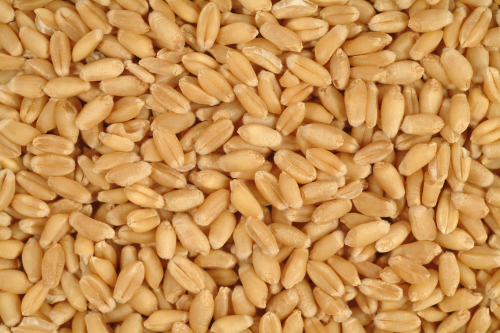 Mar 13 Paris wheat rose EUR1.50/tonne to EUR245.75/tonne. EU-27 wheat exports continue unabated, currently up 3.7 MMT, or 44%, based on year ago levels. To counteract that, Brussels have issued import licenses for 3.9 MMT more corn than at this stage in 2011/12 as the latter replaces the former as a feed stock. It's not just here in the UK where wheat production prospects for 2013 already look questionable. FranceAgriMer report that only 66% of winter wheat there is in good/excellent condition, versus 82% this time last year and down from 74% as at Dec 3rd. In the country's top wheat producing region of (the imaginatively named) Centre, where more than twice the normal rainfall fell in December, only 42% of the crop is rated as being in good/excellent condition. Development is also well behind, with only 80% of the winter wheat crop at the tillering stage versus 99% this time a year ago. The winter barley crop is 67% good/excellent, versus 74% in early December and 72% a year ago. Tillering is placed at 90% versus 100% this time last year. Russia said that it exported 178 TMT of grains in the first fortnight of the month, of which only 57 TMT was wheat. That brings their 2012/13 marketing year-to-date total to 13.69 MMT, down by almost a third on this time a year ago. Argentine weekend rains were lighter than expected and focused on the north of the country, missing the worst drought-affected areas. In the US "A significant storm system is expected to cross the central Plains into the Midwest later this week, though, which should increase snow cover across the central Plains into the west central Midwest. This snow will be very beneficial in improving soil moisture and river levels once it begins to melt. Snow cover will likely remain a bit limited in the northwestern Plains, however," said MDA CropCast. Dock workers in the major Brazilian port of Santos are said to be ready to hold a strike on Feb 22 in protest against the government's plans to raise cash by passing ownership of up to 95 of the nation's leading ports to private companies. The Santos strike will be followed by similar stoppages at other ports nationwide, say the unions. Workers are concerned that the deal will lead to lower wages, job losses and reduced working conditions. An open-ended strike is planned for Mar 18 if worker's demands aren't met, add union leaders. Meanwhile Reuters are reporting dockers at the privately-owned Santos container terminal of Embraport have occupied a Chinese ship trying to unload cranes destined to be part of the government's port modernisation program. These kind of disputes look set to be a feature of a "summer of discontent" where protesters will be well aware of the supply & demand balance of power within the grains market switching more acutely than ever before almost entirely to South America in the coming months. 18/02/13 -- Rapemeal prices on the continent are mostly firmer today. The nearby market remains tight with offers for Feb delivery are still withdrawn. With US markets closed for President's Day there's maybe a bit of protection being built in today. 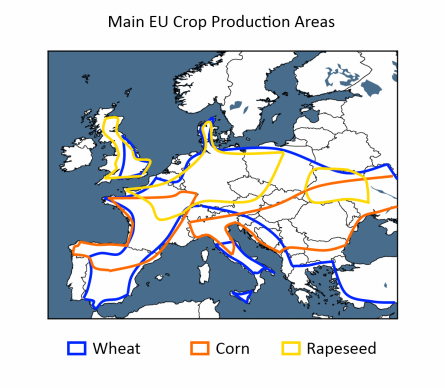 French and UK rapeseed production prospects are questionable, keeping new crop prices steady.